Festivals are the celebration of togetherness, Raksha Bandhan which means a 'bond of protection' is one such festival that is all about affection, fraternity and sublime sentiments. It is an occasion to flourish love, care, affection and sacred feeling of brotherhood. Not a single festival in India is complete without the typical Indian festivities, the gatherings, exchange of sweets and gifts. We all should celebrate these with great enthusiasm and fervour. In order to mark its authenticity, ?Rakhi Celebration? 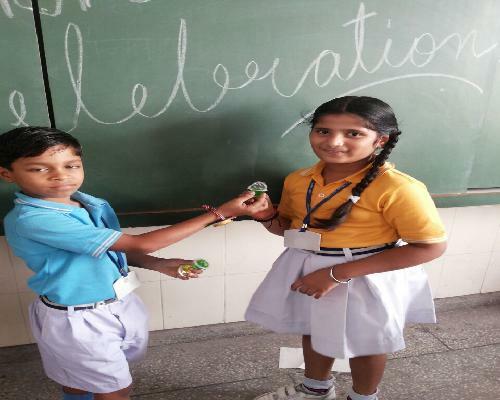 was organized in the school premises for the students of class ( II-IV) .Students of class IV were motivated to make ?Rakhis?? with the waste material. They demonstrated their creativity by making beautiful rakhi. To explore their hidden talent a ? Rakhi Stall? 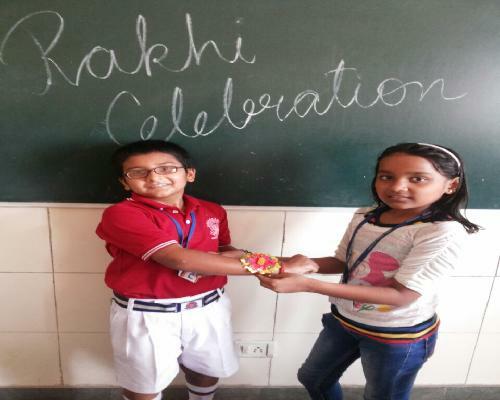 was put up and little ones of class ( II & III ) were encouraged to purchase rakhi so as to acknowledge the efforts of the students of class IV. All of them were very excited and participated with great zeal and enthusiasm. The objective of this activity was to showcase their potential and create the feeling of togetherness.